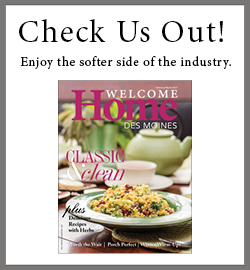 Business: Hannah Homes is a home building company based in Des Moines, established in 2013. Our homes are built with a high level of craftsmanship and care. I am a very hands-on builder, giving each of our homes the attention it deserves, which ensures that the final product meets our high standards. Background: I grew up in Granger, and graduated from Iowa State University with a degree in Landscape Architecture. I worked as a professionally licensed Landscape Architect at Shive-Hattery in West Des Moines prior to owning Hannah Homes. Family: My wife, Erin, and daughters, ages 2 and 5. Why I love what I do: As a detail-oriented person, I enjoy seeing the little details of a project come together to make the final product. It’s very rewarding to see each project go from concept to completion. Skill I’ve developed most on the job: As a builder, I’ve really developed my time-management skills to coordinate subcontractors efficiently, and keep my project timelines on schedule. How I give back to the community: Recently, I have volunteered through my church for Habitat for Humanity, and am excited to continue working with this important organization. How I get away from work: I’ve always enjoyed golfing. My dad was the superintendent at Jester Park golf course for more than 25 years, so I’ve grown up playing the game. The most significant recent change in the home building industry is: Energy efficiency has become much more important in the home building industry. Advancements in insulating and air sealing practices have made it possible for homes to be much more energy efficient. What makes me unique: When designing a home, I use a 3D computer modeling process that helps make blueprints come to life before construction even begins. Clients are able to see what their home will look like from any angle, helping to ensure that their needs and desires are being met.